Andrew Raimist will be presenting a seminar on Thursday 26 May 2010 on modern architect Harris Armstrong's interest in, use of and influence on the practice of masonry construction. The event will be held at the Masonry Institute of St. Louis (MISL). While know as the earliest, most recognized modernist architect in Saint Louis (practicing from the 1920s through the 1960s), he developed an increasingly sophisticated knowledge of the history and use of masonry construction in the Midwest and throughout America. In the earlier years of his practice, he designed and built structures in a variety of styles and under many different influences. 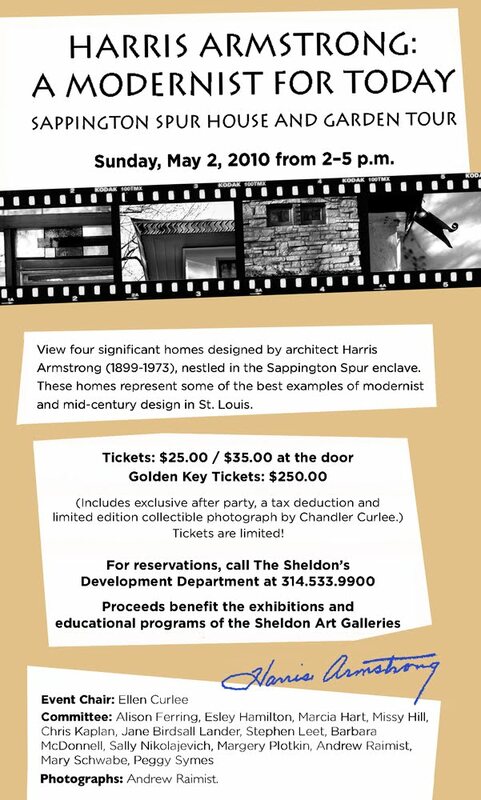 At the same time he created the International Style design for the Shanley Building, he was creating buildings in a traditional Missouri vernacular manner, a Williamsburg style home, Prairie style homes and buildings created under a wide range of influences. This eclecticism was particularly evident during the 1920s and 1930s. The talk will present the full range of Armstrong's use of masonry from early traditional designs, unbuilt projects conceiving the modern architecture of the future, radical modernist practice pushing the envelope of technology and practice, as well as his personal trademarks and unique applications of masonry in the context of comprehensively designed and implemented modernist architecture. The talk will include a critique of Armstrong's use of masonry in non-standard applications with a view toward understanding which methods succeeded and which failed (with regard to long-time weathering, functionality, maintenance, aesthetics and permanence). 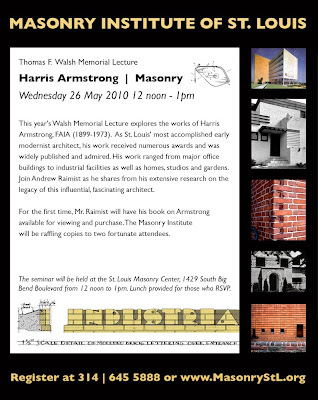 Raimist's book Harris Armstrong | Masonry will be available for purchase for the first time at this special event. Anyone may attend and bring guests, but all must RSVP in advance by calling 314 / 645 5888 or visiting www.MasonryStL.org. Historic images and drawing courtesy of the Harris Armstrong Archives, Special Collections, Washington University in St. Louis. Photographs taken by author copyright © 1990-2002 Andrew Raimist. You are invited to attend this rare opportunity to tour several of Harris Armstrong's most significant residences. The house tour is a benefit for the Sheldon Art Galleries. Tickets for the tour will be available Sunday on site. Park at the Hough School (at the corner of Sappington and Lockwood) and take the shuttle bus to Sappington Spur. Homes will be open to tour between 2 and 5pm. There will also be an "after party" for "Golden Key" ticket holders with several added benefits including specially commissioned photographs, a slide talk by Andrew Raimist, great food at Durb & Ellen Curlee's home (Armstrong's second residence circa 1938) and the company of other interested donors.